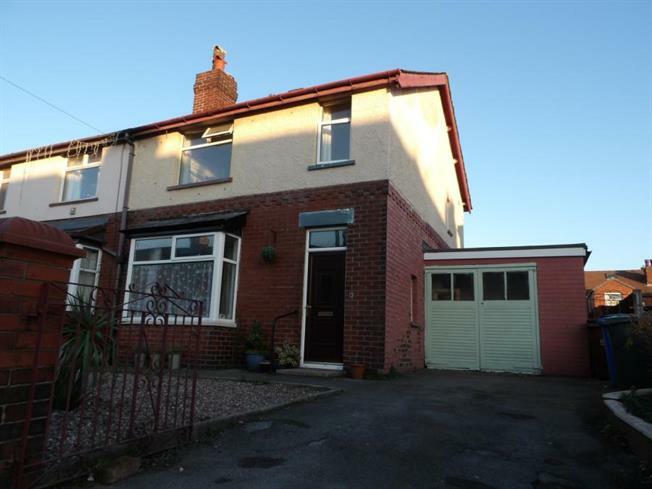 3 Bedroom Semi Detached House For Sale in Chorley for £140,000. Located in a very convenient location close to local supermarkets and Chorley Town Centre this three bedroom semi detached property is a must to see, briefly comprises lounge with bay fronted window, second reception room and a recently fitted kitchen, the first floor consists three bedrooms and a modern white three piece bathroom suite. Externally there is a driveway providing off road parking and access to the attached garage, front and good size enclosed rear garden. Further benefits include recently installed boiler, gas central heating and double glazed windows. Viewing is highly recommended. Upvc double glazed bay fronted window, radiator and laminate flooring. Ornate fire surround and hearth, wall mounted boiler and Upvc double glazed window to the rear. (measurements are a maximum of L-shaped room) Recently fitted modern kitchen with a range of wall and base units with contrasting work tops, integrated oven and hob with space for other appliances, sink and drainer with mixer tap, tiled to compliment, rear access door and glazed window over looking the rear garden. Built in wardrobe and Upvc double glazed window. Laminate flooring and Upvc double glazed window. Fitted with a modern three piece white suite with panel bath and shower over, low level Wc, wash basin with vanity unit, tiled to compliment and Upvc double glazed window. Front low maintenance garden with driveway providing off road parking and access to the attached garage, the rear has a good size enclosed garden with lawn area and paved patio area.